Facebook is about to turn scrolling through your feed into an even more obnoxious drill. The social media giant appears to be currently testing a new poll format that nobody asked for: voting with animated GIFs. The feature practically works in an identical way to the standard poll format, but lets users vote with GIFs instead of simple text responses. Much like regular text-based polls, it is up to the creator of the poll to choose the GIFs users can react with. Head to the Status update field and open the extended menu. Scroll through the various options and select the Poll option. Hover over the GIF icon in the voting option field and choose the image you want. You could also make your own caption for each GIF. Note that the GIF poll feature currently supports only two voting options. So make them count. Choose a voting question and select how long you’d like to run the poll for. For background, Facebook polls have been around for quite some time now, but so far they were strictly text-based and mostly restricted to Pages – not personal accounts. In fact, the social media heavyweight experimented with GIF polls for Pages on a few occasions earlier this year, most recently in September. But now it seems the company is finally prepping to roll out the feature to all users – whether you like it or not. 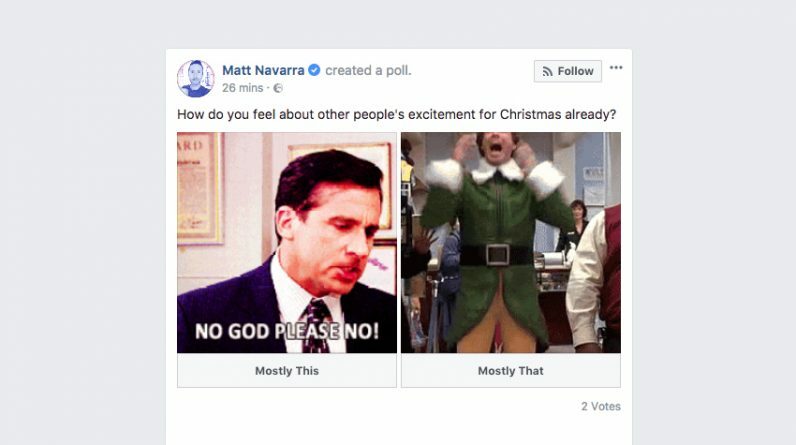 “It’s no big surprise to see Facebook has opened up GIF polls to users as well as Pages,” said TNW’s in-house Facebook geek and Social Director, Matt Navarra. “This adds yet another way for people to express themselves and engage with their friends and family, and could actually useful as much as it is fun. Although some users may start to tire of endless GIFs in their News Feed making it look even more Myspace-esque,” he added. Facebook has been gradually revamping its Status update feature with more options. Over the past year, the company introduced colorful Status updates; it also toyed around with adding a similar color functionality to its comment section, though it seems that plan has been shelved for now. Quite frankly, I sort of hope the GIF polling feature will follow the same path.